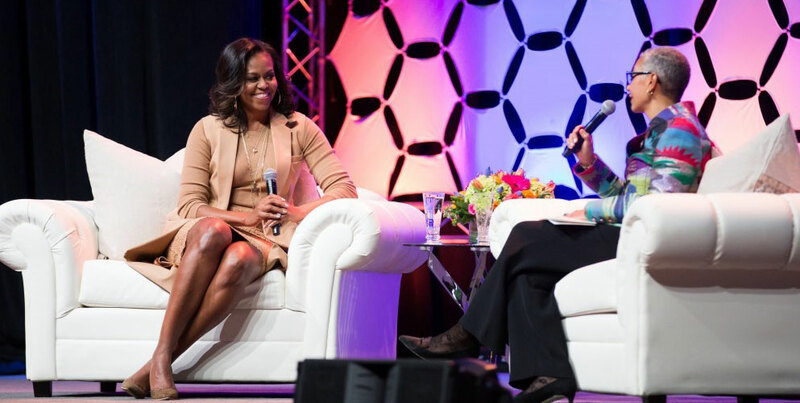 When Michelle Obama spoke to a sold-out crowd in Indianapolis in mid-February at an event organized by the Women’s Fund of Central Indiana, her message embodied the core essence of philanthropy. The former First Lady also encapsulated six themes that women can embrace to fully engage and maximize their philanthropic efforts. 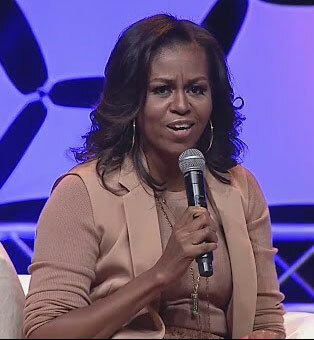 Michelle Obama speaks to the sold-out crowd at Bankers Life Fieldhouse. Role models. Obama said, “The most important role models that you have are right in front of you.” As women in philanthropy, we have to remember that others are watching; our children are watching. Women Give 2013 found that role-modeling philanthropic behavior is important but that talking to children about philanthropy has a greater impact on children’s giving. Being heard. To a question about how Obama made sure her voice was heard throughout her career, the former First Lady said, “I was loud and persistent. OK, maybe not always loud, but always persistent.” She said that the committees on which you serve make a difference and gave the example of serving on the recruitment committee at the large law firm where she worked to guarantee that the firm honored its commitment to diversity. For women’s philanthropy, this may mean asking to serve on investment, budget, or HR committees to ensure that your voice is heard in these important governance and management areas. Solving problems. Obama stated her focus is on trying to fix systemic problems; for her, this is a better use of her time. This approach is comparable to comments made by women philanthropists in a recent WPI report, Giving By and for Women: Understanding high-net-worth donors’ support for women and girls.” One interviewee in the report said, “The way I like to describe it sometimes is that it’s like there’s an acid river with a waterfall. And down at the bottom, lots of people are getting burned and lots of people are doing CPR down there. And that is direct giving. It’s really important and vital, right? But at a certain point, I started thinking, we need to turn that spigot off, because this could go on forever.” Another said, “I was really interested in funding organizations that went upstream and try to address the root of the problem.” More women are willing to take risks with their philanthropy to advance the causes about which they care so deeply. Power. Obama recognizes that women are socialized to put themselves “third, fourth, or last” and that makes it harder to “ask more for us.” She acknowledged that women are everywhere right now. “But if we’re everywhere being quiet, if we’re everywhere being afraid, then we’re not really using the leverage to our advantage.” Some women in philanthropy are finding innovative and creative ways to leverage their assets, their leadership, their experiences, and their power to accelerate the changes they wish to see in their communities and around the world. For more women to step fully into their philanthropic power is the next step in growing women’s philanthropy. According to newspaper reports, the event raised $1 million to support the work of the Women’s Fund of Central Indiana to create transformative and sustainable change for women and girls. Perhaps more significantly, Obama challenged the 12,000 in attendance to lead from where they are, to become active, to vote, and to be responsible to the world around them. When each of those in attendance takes that message to heart and shares it with 10 or 20 others, real change can occur. And that is a real example of the power of women’s philanthropy. Andrea Pactor is the associate director of the Women’s Philanthropy Institute. Michelle Obama is an inspiring role model. And she really walks the talk. Hope she’ll be able to reach out to more people and spread her message about the core essence of philanthropy.